My therapist suggested that I should think about some hobbies other than gardening to balance out my life. I gave it some consideration and then decided “why not”? It might be fun to do something other than gardening, especially during the cold, snowy, icy, dark winter months. 1. Stamp collecting. I could collect stamps with plants on them, like the holiday stamps I bought this year. I’m sure I could find stamps with flowers, vegetables and other botanical delights on them, too. 2. Counted cross-stitch. Back in the day, I did my fair share of counted cross stitch. I could take it up again, albeit with some good reading glasses, and make a pillow with a saying on it, perhaps a saying like “We can have flowers nearly every month of the year.” by Elizabeth Lawrence. 3. Cooking. I could specialize in cooking that involves the vegetables I grow in the garden, maybe branch out to canning and freezing them. 4. Model Railroading. Wouldn’t it be fun to set up one of those miniature railroads out in the garden somewhere? I could plant all kinds of miniature plants and arrange mini landscapes around the tracks. 5. Fishing. I could dig a few worms out of the garden, catch some fish, and then bury the fish heads in and around the corn for fertilizer, the way the Indians did. 6. Sewing. Ha ha. My sisters are laughing over this one. I never "took" to sewing. I’m not sure what I’d make – maybe quilts? I’ll bet there are all kinds of floral fabrics to choose from. 7. Apron Collecting. Do you think I could collect aprons with flowers on them, maybe make it a goal to find aprons with the various state flowers on them? Or maybe I could find some aprons made out of old seed sacks? 8. Scrapbooking. Oh, yes, I could make scrapbooks for all my gardens and include pictures of all the plants. The scrapbooks would be sort of a catalog of the garden. 9. Tropical Fish. As a bonus, I could grow aquatic plants! 10. Basketball. Well, I wouldn’t play basketball, I’d just watch it and notice all the subliminal messages about gardening. I’ve been looking at your list of other hobbies. I think you’d better just stick with gardening as a hobby. That is too funny! I love reading your site. They all sound like find suggestions. It is only this cold and snow making you think of something to do other than garden. It won't be long and you will be back in the garden ho ho hoeing away. Dr. Hort has it right, Carol. 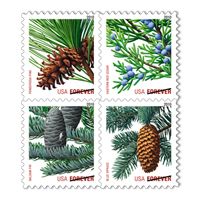 You just better stick with gardening, although the stamps are cool! I bought those same stamps! I love them! That's too funny. And yes I have those stamps too. That is great! We went to the beach and wound up taking pictures, mostly of the flowers in the dunes! PS That was supposed to be trust me! LOL! How about photography or painting? Cooking is a hobby of mine, but not so sure on the others. A little too, well. get me a pillow, I am ready for a nap. Too funny! What do therapists know?! Excellent suggestions. And I was happy to receive an early gift of a garden apron with pockets to hold tools. It is printed with peonies and daisies. I can use it when cooking vegetables, until I can get back out into the garden. Stamp collecting could include pollinators, too. Haha, I can relate to this. Thanks for tickling my funny bone! Should take up those indoor hobbies like crosstitch, sewing, baking, etc especially during winter months, very rewarding and feel the satisfaction of creating something maybe for Christmas decorations or gifts! Happy holidays and Merry Xmas! carol, every time i think about going to a therapist for my gardening addiction, i think that the effort would fail. plus i would have spent money for therapy that i could have spent on more plants. I have a counted cross stitch piece that says "I'd rather be gardening". "Pimp My Hoe" where people send in their sad stories and their sad hoes and you put a new edge on them, oil up the handles and find custom paint shops to add flames and knurled grips and stuff. What a great post! I think these are all fine ideas! I actually went to visit at home garden this summer where the owner had created a miniature railway in his backyard. It was fascinating. I think it could be a lot of fun to build and maintain. Oops, I forgot to add--basketball, definitely! Looking forward to the Big Ten season this year! ha! i took up sewing to make t-shirts and tank tops that I could wear to work in the garden!